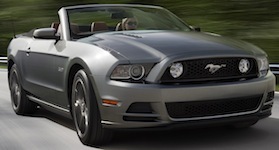 The 2013 Mustang GT comes with the 420hp, all-aluminum block, 5.0 liter, V8 engine. Other upgrades are 18 inch wide spoke wheels or an array of wheel optional upgrades, 3:31 limited slip rear differential, grille mounted fog lamps, special rear spoiler, black grille accents including a black pony, and black front and rear splitters. This Gotta Have It Green 2013 Mustang GT coupe was at the 2012 Mustang Roundup car show in Bellevue Washington. The sun was only out for a few minutes, it was overcast the rest of the day, when I got these great shots which is our Attitude Of The Week for the week starting October 7th, 2012. It's sitting next to a Race Red 2013 Shelby GT500 Mustang with optional tarnished wheels. This Mustang GT has the glass roof and Brembo brake package, 19 inch, dark stainless painted aluminum wheels. Race Red 2013 Mustang GT coupe owned by Robert Nix from Milwaukee, Wisconsin. This is our featured Attitude Of The Week for the week starting July 14, 2013. Options include the GT Premium package, 6-speed auto select shift, equipment group 401A, RR sensing sys/security package, comfort package, and 19-inch machined alum wheels. Robert tells us more, "I purchased it from a small town dealership in Southeast Wisconsin which rarely, if ever, gets a factory allocation for a new Mustang. This one was a personal order through this dealership in the summer of 2012 but the customer could not take delivery of the Mustang because of a severe injury to his back. As a result, the dealership held this Mustang in it's garage throughout the winter of 2012/2013 and only put it up for sale around Memorial Day of 2013. So, it was effectively hidden from the world for about 7 months until I discovered it on the lot while taking a ride through the countryside on a Sunday in late June, 2013. It was a great stroke of luck." Robert's first mustang was a Candy Apple Red 1968 hardtop. Gotta Have It Green (GHIG) 2013 Mustang GT Permium owned by Jim Castillo from Portage, Indiana. This is our featured Attitude Of The Week for the week starting March 13, 2016. Jim tells us, "I just got it this February. I have been looking for the right car for a year. It has the 5.0 engine 6 speed stick trans Equipment group 401A premier trim, the comfort package with heated seats and mirrors also pony projection mirrors, and the GT coupe accessory package 5 which has louvers, side scoops and pedestal rear spoiler. It has the 19 inch premium wheels. The car is in mint condition with only 6500 miles. I added a stripe on the hood, roof and trunk. I changed the shifter knob to a GHIG one and put on Roush axle back exhaust system. I can't wait to get it on the tail of the dragon this April." Sterling Gray 2013 Mustang GT coupe with a black interior. It has the 5.0L engine and 19-inch aluminum wheels. View of a Deep Impact Blue 2013 Mustang GT coupe in the sun showing off the new color for 2013. This GT has the optional 19 inch painted aluminum wheels (+$995). Ingot Silver 2013 Mustang GT convertible with the new hood with operational vents, grille, HID headlamps, and color matched bodyside rocker panels visible in this Ford promotional photo. Ford promotional photo of a Performance White 2013 Mustang GT California Special coupe. The 2013 GTCS gets new stripes and wheels added to the new GT hood with working vents and blacked out grille. The 2013 GT/CS also sports side scoops, a rear spoiler, and in this case a glass roof. Ford promotional photo of a Race Red 2013 Mustang GT California Special edition coupe with GT/CS side stripes (and hood stripes), side scoops, 19 inch black painted aluminum machined wheels, black billet grille with tri-bar pony, lower front fascia with fog lamps and air splitter, black hood vents and much more. Set of Ford promotional photos of a Performance White 2013 Mustang GT California Special edition coupe with black billet grille, black 19 inch painted aluminum wheels, black hood vents, black GT/CS side stripes, hood stripe, and glass roof options and a lot more.